We have been undertaking a Sea Lamprey Petromyzon marinus spawning survey in the Lower River Shannon Special Area of Conservation, during June and July 2015. This follows on from similar surveys in relation to River lamprey Lampetra fluviatilis which we undertook earlier this year. Sea Lamprey is the largest of the three Irish lamprey species, and also spawns the latest. 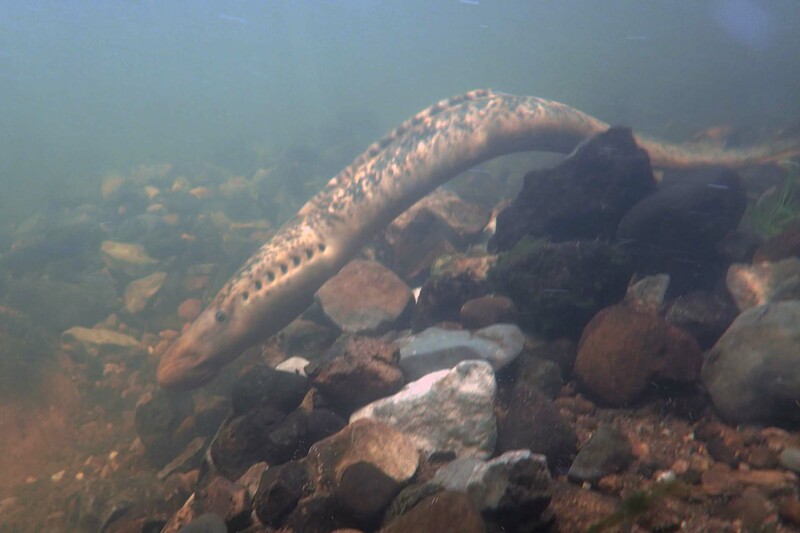 The Sea Lamprey spawning season extends from May until July, with ova taking up to a month to hatch and settle and burrow into silt deposits in backwater areas. The larvae remain in areas like this – burrowed into sit – for around 5 years – before migrating to the sea. Adult Sea Lampreys on their spawning migrations do not home to their natal rivers, like Atlantic salmon. Instead the lampreys follow pheromones released by larvae to seek out rivers with suitable lamprey habitats. The Sea lampreys spawning in the River Shannon this year could therefore have originated from any other European river. Sea lamprey is listed under Annex II of the European Union Habitats Directive (92/43/EEC) and is included in Schedule Four of the European Communities (Birds and Natural Habitats) Regulations (S.I. No. 477/2011). Sea lamprey are currently evaluated as being at ‘Unfavourable Status’ in Ireland. The Lower River Shannon is one of the key sites for this species in Ireland. Our surveys are being undertaken to inform a management plan for the Lower River Shannon SAC. We have provided some videos below of Sea Lampreys nest building and spawning on the Old River Shannon downstream of Castleconnell during July 2015. We took this video footage using a GoPro Hero 4 attached to a “selfie” stick, while wading with polarized glasses. Although selfie sticks are being banned from many locations, we find that they are very useful for fisheries surveys like this. They allow us to get very close to the the lampreys without disturbing them. This would be far more difficult if this work was completed when snorkelling. The videos above were taken on Old River Shannon on a section known as beat 6 of the Castleconnell salmon fishery. We have provided a site location video below. This footage was taken using our Phantom 3 Drone. The impact of the reduced post Shannon scheme flows is apparent in this video, along with the instream modifications that were used by the ESB to mitigate for same. Since the Shannon scheme, the “old” River Shannon receives a compensation flow of 10 cumecs (cubic meters per second). This is equivalent to only a 1 in 50 year drought flow on the river prior to the construction of Parteen Regulating Weir. Clearly this has had a significant morphological impact on this river corridor; both as a consequence of the reduction in flow and due to the instream physical modifications which have been used to date. This has had significant consequences for both the ecology and amenity value of the river. Sometimes during these surveys we record some very aggressive behaviour from the sea lampreys – see video below. Our surveys also included the River Mulkear, which is a major tributary of the Old River Shannon. See this video below of Sea Lampreys nest building and spawning on the River Mulkear downstream of Annacotty during June 2015. It is clear from this video that siltation levels are very high on the lower River Mulkear and this is of concern. It is noted that Annacotty weir is a significant barrier to lamprey migration, and most sea lamprey (and all river lamprey) spawning on the river takes place below this barrier to migration. We are very critical of the fact that a €1.7m EU LIFE project came and went on the River Mulkear without providing a solution to fish passage issues at this weir, and indeed filed a compliant with the EC in this regard. As we are now into the Sea Lamprey spawning season, no instream works should occur in any rivers in which they occur. This especially applies to Natura 2000 rivers designated for this species. Instream works on rivers with sea lamprey populations should only be undertaken after the 1st August each year. As Sea Lampreys are a European panmictic species we have special obligations to protect these lampreys which can have originated in Natura 2000 rivers managed by other member states. Unfortunately there is still no statutory close season for instream works during the lamprey spawning season on Ireland’s rivers.